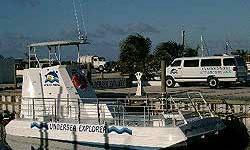 Caicos Tours Limited presents...an Undersea Explorer Expedition in Providenciales, Turks and Caicos Islands. 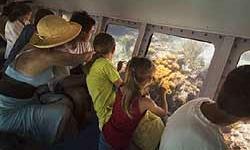 A glass bottom semi-submarine Provo?s Greatest Adventure and a great family excursion suitable for all ages departs from the famous Tiki-Hut Bar and Restaurant at Turtle Cove Marina in Providenciales. Undersea Explorer? 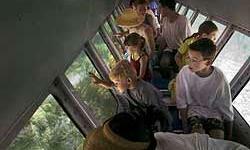 was developed in Australia for viewing the Great Barrier Reef . This vessel operates just above the surface with all passengers seated in the lower observatory five feet below the waves. This is an ideal depth to view the marvels of nature that will unfold before your eyes, all seen through your very own viewing window in air-conditioned comfort. 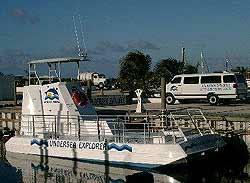 Caicos Tours Limited's 60 minute undersea adventure allows you to get down below the waves and see stingrays, turtles, exotic Tropical fish, and spectacular coral formations or maybe even Jo-Jo the dolphin, the friendly mascot dolphin of the Turks and Caicos Islands. 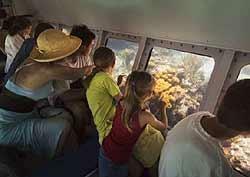 Come and experience the fascinating ?underwater world?on this tour normally exclusive to divers and snorkellers. The best part is you won't even have to get wet to enjoy yourself! 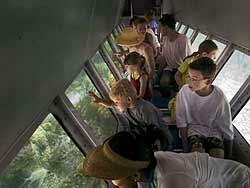 All passengers are seated in the air-conditioned lower observatory five feet below sea level with their very own panoramic viewing window.